CERN video: Cloudy climate change – How clouds affect Earth's temperature | Watts Up With That? Stay tuned for the final video in this series later this week. For more info on this years event see TEDxCERN (link is external) where the videos for this year’s talks will soon be available. This graphic may help in understanding, but is not part of the CERN video. October 13, 2014 in Clouds, Cosmic rays. It may be just one more of the tiny steps in walking the cat backward. Now, if it turns out to be a negative rise in temperature . . . . This was probably a necessary precondition to get approval for the great expenditure of firing up the accelerator just to study cloud formation. If there is a high level of precision, then the system can be calibrated. You cannot well calibrate a system that has no precision. If the muzzle of a firearm is not precise, then there is no way to make an accurate shot. A precise muzzle might miss the target on the first few shots. However, if it is precise/repeatable (for example fires 5 degrees off to the left) then the shooter can calibrate their firing and eventually consistently hit the target. A clock 5 minutes fast is very precise but inaccurate. However, if it is precise/repeatable (for example fires 5 degrees off to the left) then the shooter can calibrate their firing and eventually consistently hit the target. You are right. But if the shooter spends all his time and money improving the precision while ignoring the fact that it is wildly inaccurate, then all the precision in the world won’t make the rifle hit the bullseye. Climate scientists KNOW their models are wrong. The models output doesn’t match reality, they know certain processes aren’t properly handled (like clouds) and new processes that aren’t even part of the models keep cropping up. Ignoring the inaccuracy while working on getting it a little more precise is a waste of time and money, with most of the money being tax dollars. I guess that we just need to wait 100 years … then, based on the known data, we will be able to calibrate our precise models. Another way to state it for Mario would be: If you don’t have access to your target then you don’t know that you are 5 degrees off to the left; we do not have access to the target data…. Even if we were able to get into a time machine to access and review out target we would then realize that it is hanging by a string in a strong wind … the anticipated fine cluster of precise shoots will appear quite random. How about they model temperatures from the past within the a reasonable margin of error before taking a bite out of the future apple. Either that or quit their day jobs and join a Gypsy troupe. I get what you are saying. Yes – prediction is another thing altogether. The only way to know if the prediction is right is to wait and see of course. I mistakenly thought you were referring to using past data to model with. If the outcomes are precise, they can be calibrated. Of course none, not a single climate model has any skill at predicting or projecting climate. In other words some scholars have managed to forget the basic factors and fact regarding Water cycle…. sad to here because that’s elementary knowledge for a 4th grader to have learnt and understood…. Please don’t capitalize the B. Too close to home for me. The man is an abomination as president of the US. I prefer the ∅bama spelling myself. The adds look at your cookies (where you’ve been) and are smart enough to give you hits based on the assumed interest. Let’s not forget that Kirkby’s CLOUD project, inspired by Henrik Svensmark in the ’90’s, was delayed by politics for the better part of a decade until results of Svensmark’s modest SKY experiment in a Copenhagen university basement were published in 2006, paving the way. Seems like Kirkby has to be very cautious to adapt his vocabulary to ambient climate speak and by no means mention Svensmark. If some day climate research recovers from the present political infection, my guess is that Jasper Kirkby will be glad to acnowlege and refer to Svensmarks et al . This might perhaps seem a trifle cowardly, but is perhaps necessary, as the climate for climate research is, to be able to do any research at all. . Probably Kirkby knows that other honest scientists, including Henrik Svensmark, know this and understand his predicament. 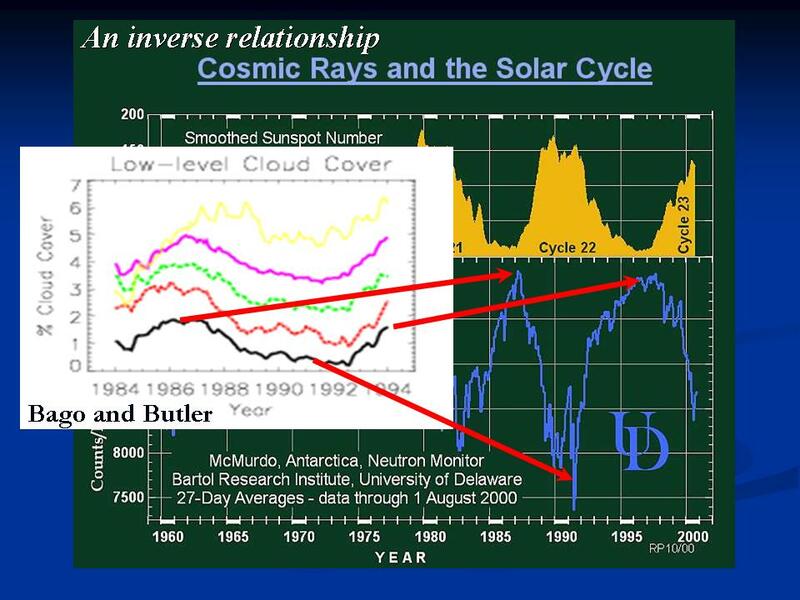 What might cause an increase in clouds perhaps more galactic cosmic rays and a more meridional atmospheric circulation both of which can be linked to solar activity. It makes too much sense to think the sun has an effect on our climate. But others’ faithfully disagree. I’m following your reasoning here… think you’re on to something Salvatore. A longer jet stream associated with more meridionality, indicates increased cloud cover and increased albedo. The layered clouds particularly raise suspicions. Altocumulus, altostratus and stratocumulus, in my neck of the woods, during the 80’s and 90’s, before the pause, were less prominent than previously or recently. The different air masses involved in the formation of these clouds (increased wind shear) could enhance locally, levels of organic cloud condensation nuclei (the chemistry being important), which, interact with cosmic rays (numbers and energy), proliferate and in turn, enhances cloud formation – the process, of course, responding to the sun cycles. And little, at least three years ago, is known about the radiative properties of the mid-level clouds…. I agree, we need to have a better understanding of clouds and their impact on the climate. They, the leftist, are on a crusade. And their first goal and victim is Control over climate science? It is the means to control energy production. Control energy, control everything. The grand price. This strategy has been concocted by the UN in the 1970ies. Since 1975 they try to blame CO2 for cooling, warming, whatever currently happens. Funny – the IPCC states they do not understand clouds, so they largely ignore them (except to state that water only has a medium to high positive feedback. How inconvenient. Next Climatology will discover that earth is 70% covered with water. Or that our weather is water driven? Without this water the climate would not be moderate nor stable. That this “science” can claim to be such, while willfully ignoring the driver of our climate, mocks modern philosophy and scientific bodies. The charlatans of the past who scried the future from the entrails of small animals have better credentials as scientists than todays brood of clucking bureaucratic sycophants. suggests that ions created by cosmic rays may not be necessary to help create cloud condensation nuclei. Neutral sulfuric acid and diethylamine reactions may be sufficient. This could be a blow to the Svensmark hypothesis, but he still gets full marks for bringing CERN in to the study of clouds. Is the hypothesis that cosmic ray-induced ions are “necessary” for cloud formation, or simply that it enhances the process? If you simply have say, 5%, more low-level clouds during periods of relative solar inactivity, this could have a large effect on climate. My thoughts exactly, Jay. The “superglue” MAY be sufficient. Or, the cosmic rays may be a rate determining factor or enhancement. Either way, we do not know enough, yet. Lance, I appreciate your word “could”. The two hypotheses need not be mutually exclusive. I believe it is quite well established that water droplets, can, and do condense on all manner of things from dust particles, to microbes, to charged particles. The Wilson cloud chamber is proof positive, that water droplets condense on charged particles, at high enough relative humidity (or below the dew point temperature and vapor pressure of H2O. Now that does not mean that nucleation on charged particles, perhaps generated from cosmic or solar charged particles, is the ONLY or even a MAJOR mechanism of cloud formation. But it is a well substantiated mechanism, and begs the question; how much of an effect is it. But ANY mechanism, that increases cloud formation at some particular Temperature, is a contributor to cloud based cooling. Dr. Roy Spencer has said, you don’t need much extra cloud formation, to cool things down. (or words to that effect). And I’m pretty much in agreement with that point of view. I don’t have the numbers to make that point quantitatively, like Roy does. I do not think Svensmark says clouds cannot be formed with galactic rays… rather he states that galactic rays can cause the particles to clump together more abundantly. Ion air purifiers ionize the air to make dust particles stick together. The result is clean air and a dusty house… it clumps and falls out of the air faster! I think it is accepted that CO2 has an effect on temperature, but that it is pretty much saturated in that other much more abundant green house gases compete for much of the energy in the spectrum that excites CO2 molecules. What we do not know is the extent of CO2 as a control knob. I tend to think it’s pretty close to doing all it can do considering the numerous possible feedbacks and hugely chaotic nature of the source of energy (the sun) and all those pesky things on our planet from water, to trees, to gases and other stuff in our atmosphere. I found it very fitting that they have the animations of the “climate scientist” rubbing and looking into a crystal ball of the Earth. A Freudian slip, perhaps, in reference to the “crystal ball” of climate models, which have been shown to have zero predictive skill? Everything that there is to know about clouds is already encoded in the mighty climate models. They embody the First Principles of the natural world. All hail the climate models. Yes obviously the models supercede nature. Kind of like how the golden cow superceded God in the Old Testament. We know how that turned out. Allegorically I mean. Warmists looking for excuses for the lack of warming. Interesting how many experiments or papers or studies seems to confirm something is the new smoking gun that proves the case for whatever side that it supports. The scientists involved, often use language that suggests they have new powerful evidence, providing a new link or new way to view the topic. Maybe if we had more honest and especially unbiased scientists using the scientific method without other influences, we would have a more realistic view of what the confidence level is in what is thought to be known(vs projected with certainty or extremely likely) and what really is just conjecture. The earth is greening up. Evapotranspiration has been soaring higher. This big factor is under represented. Trillions of gallons of water in underground aquifers have been pulled to the surface for irrigation and evaporation. This factor is under represented. Both these factors increase soil moisture and low level moisture over land. The height of clouds has been decreasing and low clouds have been increasing, partly as a result of the above. Both of these have a net cooling effect. Can you provide any data/references on this, e.g. increased precipitation? Lower clouds are warmer clouds and reflect back more energy. Increased cloud cover a night will increase minimum temperatures. How do you get a cooling effect? For those of us familiar with Svensmark’s theory, maybe. But it’s a cartoon! And it’s a cartoon that implicitly admits to the possibility that the science is not really settled, there is more to discover. That’s positive, IMHO. IMO unjustified assumptions about positive feedback from water vapor is at least as important as unknown effects of aerosols on cloud formation in accounting for the threefold range of ECS estimates. The upper range is simply not going to happen by 2100, given the length already of the plateau in GASTA, which is IMO more likely to turn cooler before warming again. What a beuatiful painting, they were so lucky to have the amount of CO2 thay had in 1800. Why do you need to know how cloudy it was in 1750, when you can just make something up and then procede from there. I wonder if science was harder in 1750…it sure seems easy now. It is a fascinating talk but it is worrying that he accepts GISS data without question. This is the wrong starting point and until such scientific hypothosis starts from a more reliable data point, we are always going to be in trouble. Now it is 5 years later, I wonder if Jasper Kirkby has had the opportunity to look at and question the starting point data. I would be interested to hear his thoughts on UHI’s, weather station positioning, manipulation of GISS and it’s comparison to satellite data. The global temperature does not cause changes in climate on a regional level it is the changes in climate on a regional level that causes the global temperature to change.The Earth does not lose or gain heat as a small object in a laboratory would ,at the same time and the same way.An increase in global temperature of four and a half degrees does not mean that regional climates must change for the worse, they could remain the same or become more productive for humans. When the lows and highs cools ocean. Good points made above. Experiments carried out in ideal laboratory conditions have their place in science but may never achieve the cloud formation they are looking for if in the real world clouds are produced from a “dirty cocktail” atmosphere. It is easy to draw the wrong conclusions for the wrong reasons. I would be tempted to use an atmosphere full of all the possible culprits and see what difference the addition of charged particles makes. Look for a dramatic result to prove the point, then get down to the detailed stuff afterwards in the knowledge that there are important interactions. Have you ever noticed on a day of sunshine and showers that it is cooler when there is cloud and warmer when the sun comes out? Have you ever noticed in a warm air mass that when the sun comes out it gets very warm. Have you ever noticed on a winter night when it’s cloudy the air temperature is warmer, but without cloud it’s considerably colder. Of course you have. Just think if they could measure the differences. Oh they can, so why don’t they? Who needs to spend $/£billions on CERN and computer models? And just to show how simple I am. Pre-Industrial times of course /sarc; the Earth has been almost completely covered in ice but, has also been ice free. Doesn’t the vast differential in temperatures between the two states account for natural variation? After all it happened before mankind evolved. So how do they identify the effects of 0.04% CO2 x 1.7% (0.0007% anthropogenic of GHG) and the enormous difference of natural variation?. Why does the woman in the animation have Mickey Mouse shaped hair and cookie monster eyes? HUH?!?!?!?! The temps can only go up?!?!?! I’m late to this but having listened to this video twice I am encouraged that there is an acceptance at CERN that the science isn’t settled, I agree that wording has been careful but I would like to hear more discussion from the likes of CERN on previous climatic conditions. Life on Earth has been interrupted so many times in its history and our very small bit of Earth time is a relatively benign period. But it is likely to be short-lived and most of life on Earth has progressed through periods of climate far warmer and CO2 richer than our current inter-glacial period. What I would like to understand is the variability of the energy received from the sun, it appears, in this video, to be a constant irrespective of the radiation of the energy back into space. 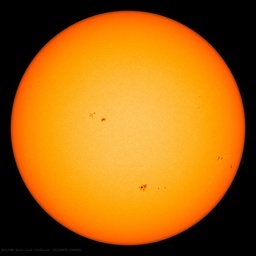 I am no physicist but I understood that the energy received from the sun is not a constant, the sun is not static and the energy output is variable. I would appreciate being put right on this point, but if there is a variation how does this fit into the equation? Finally, the video begins with the benchmark guesstimate of 1.5 degrees C to 4.5 degrees C and relates it the change in global temperature since the last ice-age. It would be interesting to have CERN explain why there was an ice-age, what the conditions were previous to the ice-age and what conditions would there need to be in order for the ice-age to return. We already know most of this, but if we are (as a scientific species) to seek to understand what is happening now, what will happen the future, we must relate it to the past and in detail. After all one of the main criteria in any science, is being able to repeat the experiment in order to prove or disprove the hypothesis. Clearly we cannot do this with eons of climate behind us, but understanding where we are now and hypothesising on future climate requires an explanation of past climate and how it relates to the present. The presentation in the video is simplistic and suitable for all but Kuhnat is correct, temperatures can only go up? Past evidence, I believe, says not and CERN should demonstrate this. Milodonharlani has made the point I always make to anyone who cares to listen to my ramblings, Constable did not paint clear blue summer skies. All his paintings were compilations of sketches made during the summer months. There is plenty of cloud in all of them. So next step (similar to spacecraft/satellite shielding) is the construction of equatorial electromagnetic meshes to cut the excessive cosmic rays and reduce their impact on Earth! So, post 1750 – the start of the industrial revolution- is used to assess the affect of CO2 from human activity on climate. Prior to 1750 were there not many periods in which the climate was much warmer than today? ….. And many periods in which it was much colder than today? …….and many (all ?) of these warm periods ended as colder climates became extant?………and all these warmer periods eventually ended as colder climate arrived? So then , WHAT CAUSED ALL THESE PRE-INDUSTRIAL REVOLUTION DRAMATIC CHANGES IN CLIMATE?? As is the norm, the AGW, Lysenkian religious zealots ignore the $1000000000 question. Because they haven’t a clue as to the answer. And they have not a clue because they DO NOT KNOW what are all the myriad variables and their interactions that cause climate to change. If you cannot explain the historical climate , you cannot presume to predict the climate with even the most tenuous degree of reliability. It is simply astounding that ALL these climate models, a priori, ASSUME that it is CO2, and ONLY CO2, that drives climate. Nothing else. And that every other conceivable variable that can affect climate serves only to mitigate or amplify the affect of CO2 on climate. Amazing coincidence, is it not, that CO2 is a by product of industrial / economic activity and progress.